We've been trying to reduce processed carbs especially for dinner (which I mentioned a few weeks back and then posted two weeks of highly processed recipes... oops...but who can resist trying new GF products??). We actually have really liked this switch especially when we compare the number of calories in a serving! Here are a few of our favorites from the past couple of weeks. All of these are even toddler approved! 1. 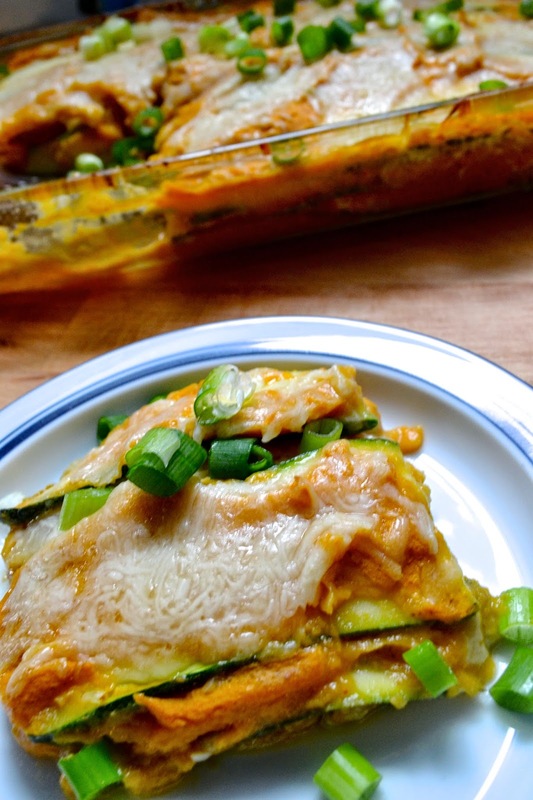 Sweet potato and zucchini lasagna. (our version picture above) We've used the trick of thin zucchini slices in the place of lasagna noodles before (easy way to make any lasagna GF) but this sweet potato sauce is a pretty awesome twist. We used ground chicken instead of sausage and it was really good but I definitely want to try the sausage version. 2. Slow cooker black bean soup. This was so easy and sooo good. This is a perfect meal to make if you are going to have a long day at work and don't want to cook. 3. Cabbage Rolls. I improvised a bit on this one but followed the general theme of seasoned ground turkey with veggies and cheese. You can throw in some rice or quinoa if you want to but we kept them simple and it brought us right back to Hungary.